Dr. Wilson Adebogun Badejo, a former General Overseer of the Foursquare Gospel Church will be seventy on May 19, 2017. The cleric has received congratulatory messages from several church leaders and the Acting President, Professor Yemi Osinbajo (SAN). The Acting President on Thursday shared his best wishes with all members of the church, friends and family of Rev. Badejo who has worked and still works diligently in spreading the gospel to various corners of the country and across the world. Prof. Osinbajo also commends the foresight and large-heartedness of the former General Overseer in instituting the Wilson Badejo Foundation which caters for the poor and vulnerable, amplifying his regular message that the church remains the last hope of the downtrodden. As he joins the septuagenarian family, The Acting President believes Rev. 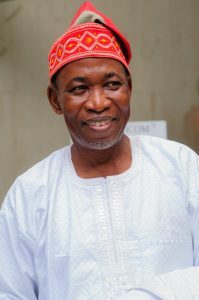 Badejo’s zeal for serving God will be rekindled, recommending his attributes of self-discipline, unwavering commitment to the truth and love for the poor to younger and upcoming ministers of God and all Nigerians alike. Osinbajo also prayed that the Almighty God grants him longer life, good health and strength to keep spreading and living the gospel. “As his days are, so shall his favour with God be,” Osinbajo prayed. At the Church Blog, we wish Rev. Badejo a happy birthday celebration and also pray that God preserves his life to live more fruitful and purposeful years on earth. I felicitate with my Daddy in the Lord, Rev. Dr. Wilson A. Badejo as he clocks 70 years on earth! Our Daddy G.O emeritus, may the good Lord continue to shine His countenance on you, renew your strength and grant you your heart desires and above all grant u the enabling grace to make it to heaven IJN….Amen. Daddy, Congratulations!….. Pst. Jide Asolo & Family (FGC, PHC District).